Prominent Venezuelan lawmaker Freddy Guevara has sought refuge in the Chilean ambassador’s residence in Caracas amid fears he could be jailed, a development that leaves the ailing opposition with even fewer leaders to take on leftist President Nicolas Maduro. Authorities had sought to remove Guevara’s congressional immunity so that he could be tried for instigating violence. The opposition and local media said that Sebin intelligence agents had surrounded Guevara’s house over the weekend. Venezuela’s government has released two prominent opposition activists it has held for more than a year without trial, one of them a Spanish citizen, as President Nicolas Maduro looks to ease international pressure following months of unrest. A Venezuelan journalist said Tuesday that he had been released following two days of captivity and torture after photographing criminal gang activities inside a prison. Freelance photojournalist Jesus Medina posted photos on Twitter showing bruises on his face and body. «They tortured and threatened to murder me,» he said, adding that he will continue to report the truth in a fight to improve his country. Join ViceVersa Magazine for “Bitter Laughter”, an annual event that analyses important issues affecting Latin America and Spain through the lens of art. This year, Bitter Laughter will showcase the works of female cartoonists from Latin America and Spain. They will explore sensitive subjects, such as gender inequality and freedom of speech, with a pinch of humor inherent in political satire and cartooning. Though the release of two prominent political prisoners in Venezuela was worthy of celebration for many opposed to Nicolás Maduro’s regime, hundreds of other still remain behind bars illegally. Opposition leaders Yon Goicochea and former Mayor of the municipality Mario Briceño Irragory, Delson Guarate, were released this weekend. But according to the NGO Criminal Forum, there are more than 350 illegal detainees in Venezuela even after their release, and 27 others. A scrappy, independent newspaper in Venezuela that never shied from fights with the country’s powerful socialist leaders circulated its last print edition Thursday, but its staff of reporters and editors aren’t declaring defeat. 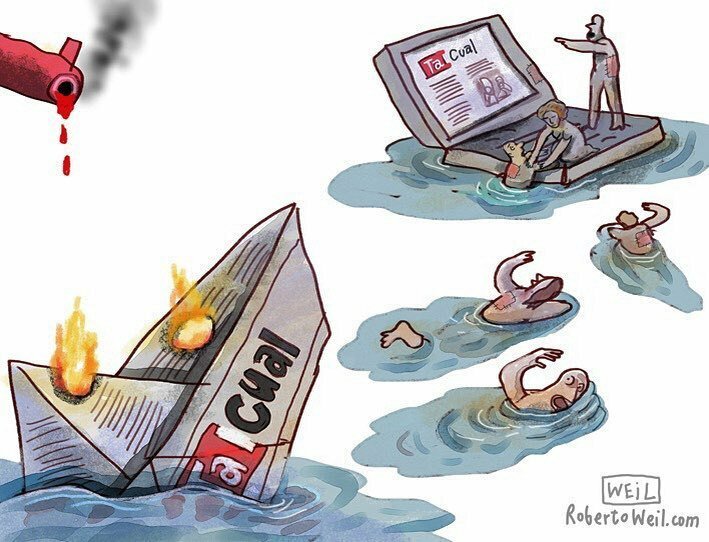 Launched in 2000 by a former leftist guerrilla fighter, Tal Cual will continue to tell stories of the country’s tumultuous times as an internet-only publication.